I was intrigued enough by this review at Pencil Talk to search out the Stabilo GREENlighter highlighting pencil at a stationer's some distance from my home. I've used Stabilo Boss highlighter pens for years, but the idea of using a pencil for hightlighting text made more sense. I've found all highlighter pens dry out unless you replace the cap, and of course the process of highlighting demands the reader to use it intermittently, which means having to take the cap off and replace it numerous times during a spell of reading and highlighting. Another reason for using a pencil is that I have found highlighter pens to smear fountain pen ink, and as I use a fountain pen I wanted to avoid that if at all possible. Based on the Pencil Talk review, I purchased only the yellow version of this pencil; the green and pink variants aren't as good, apparently. It takes a little getting used to, because more effort is needed to leave a useable layer of highlighter than a pen. The hightlighting is more subtle than a pen's. The highlighting core has a smooth, deep waxy feel and glides over the paper, though as I say, it needs more pressure and multiple passes to leave a healthy line. The barrel of the pencil is triangular in section and painted in dayglo yellow with thin white lines. All information is printed in black, as is the FSC logo. I've really enjoyed using this pencil and it has found a place in my pencil case. This one is a winner, in my view. 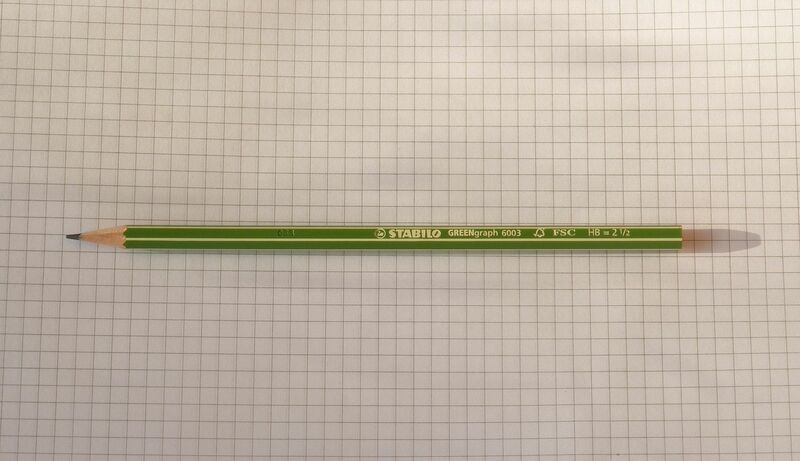 Another quick review of a Stabilo product, this time their "green" pencil, the GREENgraph 6003. This HB pencil, which comes in eraser-tipped and non eraser-tipped versions, is Stabilo's effort at developing, manufacturing and marketing a pencil which is produced from wood managed in a sustainable way. 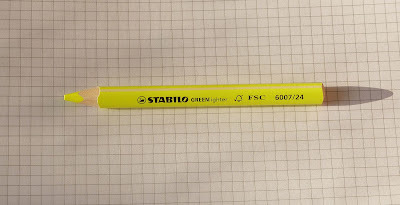 This pencil, along with others in the Stabilo stable, is designed to conform with Forest Stewardship Council (FSC) rules on woodland management; Stabilo as a company has been registered with FSC since 1998. It claims to be "first FSC-certified writing instruments manufacturer and hence a pioneer in the industry". All well and good, though I have just tried (unsuccessfully) to confirm this. Penciltalk tried to check the Chain of Custody for a review of the GREENlighter highlighting pencil, but found the online documentation to be less-than-helpful. 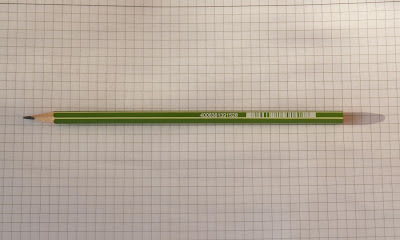 In any case, this pencil is a conventional hexagonal HB pencil, finished very nicely indeed in a cheerful spring-green colour with white stripes. 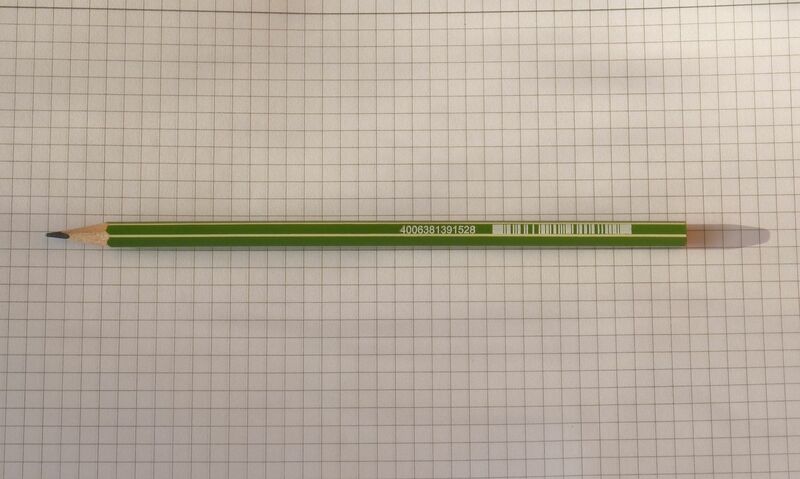 There's a bit of user info, including the FSC logo to remind the user this is an eco-pencil, but no country of origin information. The reverse has a stock number and barcode. Mine does not have the eraser. 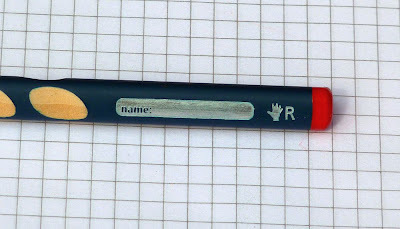 This pencil writes in similar fashion to the Stabilo Swano 4907 I reviewed a while back. It's OK, not unpleasant, though it has that grittiness I mentioned before. 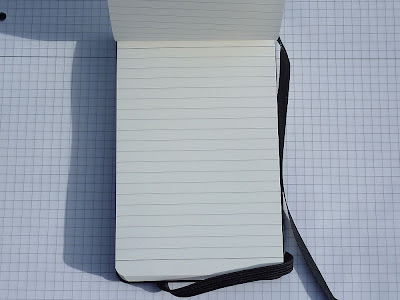 It's fairly dark and leaves a dense line on paper; it's slightly lighter and firmer than a Staedtler tradition HB, but without the smoothness of the latter. In the hand, it's actually quite comfortable, though I did not use it for extended writing. I've put mine in my bag as an everyday pencil, which I feel this is. It's really a competitor to the Staedtler Noris, and is a good quality, workaday pencil. Stabilo has produced a nice one here, and I'd be happy to own and use more in the future. This one cost me 50p in a stationer's here in England (no, not the one I complained about recently). I reckon this could be difficult to find as it struggles to find shelf-space in the shops; most stationers here sell either Staedtler or Derwent. In summary, then: a good everyday pencil, though still more expensive than a Noris. I love the stylised typography of the words "Staedtler" and "Jet Bonded". The model number is obscured by the price label - but I think this was model number 114. This pencil is a bit scuffed from years languishing unloved and unwanted in the stationer's pencil rack, but I'd like to think that has now ended and it has found a welcome in my modest collection. I've not tried writing with this pencil, so don't ask yet how well it writes. 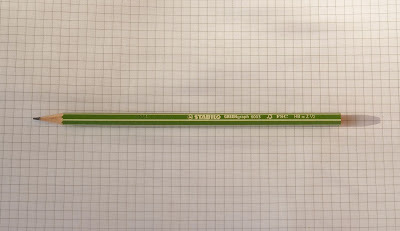 I did not even know that Staedtler made stenographers' pencils here in the UK, so this was a delightful surprise for me. This clearly is one of the predecessors of the rare-as-hens'-teeth Stenofix. As it happened, I found this just around the corner from where I used to work, and shared an office with a shorthand typist called Joan. That office is now a hairdresser's. This pencil was a bargain, as it cost me only 50p! I feel like I've just unearthed Sutton Hoo. What a shame they only had one in the rack, as I'd have had the lot. 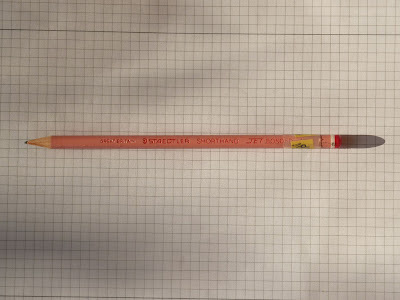 Never mind, I also found a somewhat beaten-up made-in-GB Staedtler tradition 2H too. 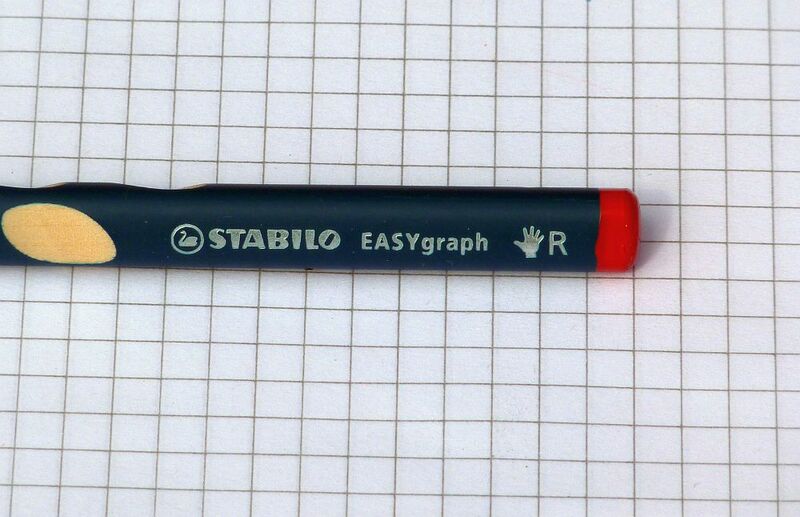 Another quick review, this time of Stabilo's EASYgraph learner's pencil. I bought a twin-pack of these from my local stationer's for £2.00 in September 2010. 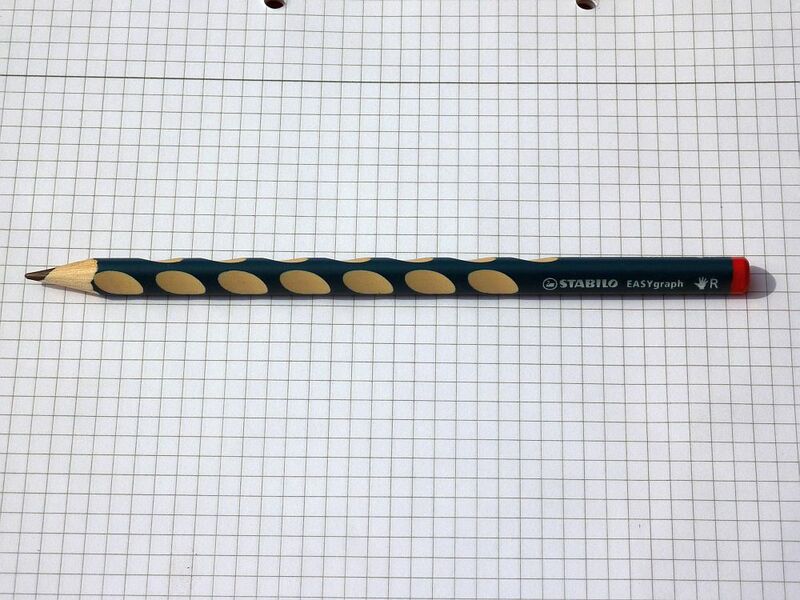 This pencil is an over-sized "ergonomic" pencil aimed at the early learner's market and is clearly in competition with Staedtler's Noris Ergosoft range. The idea here is that small children have difficulty holding a conventional pencil when learning to write, but can grip an oversize pencil more easily. Ergonomic pencils usually also feature some form of textured grip surface in addition to the larger diameter. 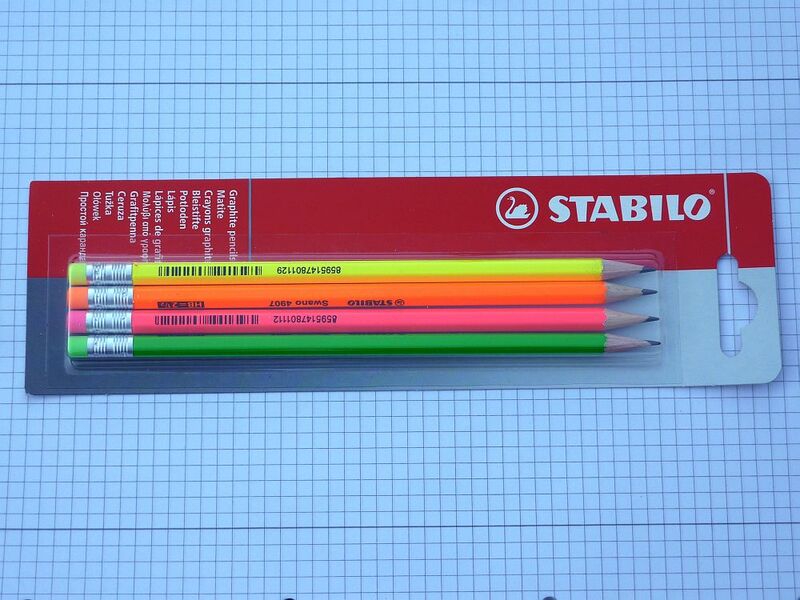 Both pencils have the fashionable triangular cross-section pioneered by Faber-Castell. 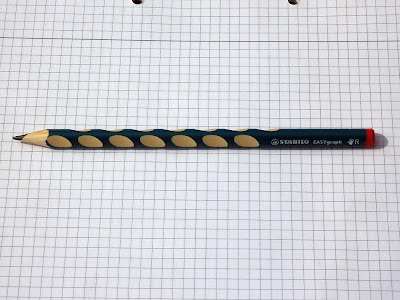 The Ergosoft pencil has a non-slip finish; the EASYgraph is painted in a cool, dark blue with a greenish tinge, and has a series of gouges in the wood, set at around 45°, to guide fingers to holding the pencil at the right angle when writing on paper. These depressions are set so that the pencil may only be held comfortably in the hand it was designed for, so that a right-hand pencil may only be held for a period in the right hand, and the left-hand model held in the left. The right-hand model has the end dipped in red paint; the left-hand model has a yellow dip. The EASYgraph also has a small panel in which the owner can write their name (presumably in ball-point pen). The HB lead on this right-hand model has a bit of resistance to it, but leaves a dark, thick line: perfect for small children. It's not too shabby for adults who should by now know how to write, either. Some people have criticised the lead for being scratchy but I've not found this to be the case in the short time I've used this pencil. 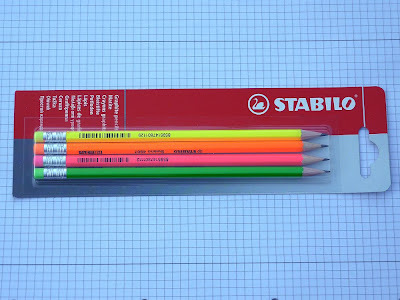 I would probably not send my children to school armed with one though, because the EASYgraph stands out a mile compared to a conventional school pencil such as the good old Staedtler Noris HB. It would either attract ridicule from classmates for being a "learner's" pencil or would be stolen or hidden; either would be distressing. Children can also be a bit fussy about their pencils as well, and the ergonomic grip may not suit everyone. This is one of Stabilo's more interesting pencil designs, and shows that there's still new things to be done with the wood-cased pencil. I doubt that I would use this pencil regularly, but I am glad that Stabilo have taken the risk with this design and I wish them well with it. Oh, and it works well for adults, too. Local Shops for Local People? The town in the South West of England where I live is a small but lively market town with a good range of shops. One of these is a stationery store which appears to do good business; they're usually busy when I visit, at any rate. I suppose I ought to be grateful that my small town can support such a place when other towns in the district cannot. This shop sells a wide range of products with brands such as Caran d'Ache, Parker, Pilot, Staedtler, Tombow, Woerther, Letts and Clairefontaine available in stock. The shop is crammed with goods. The prices. I realise that a retail premises is likely to incur higher overheads than an online business and will therefore charge manufacturers' recommended retail prices for goods. Fair enough. The mark-ups are consistently high, and there’s no discounting that I can see. I’ve never seen this shop offer bulk discounts for anything. (I've never asked though, for fear of causing offence.) A boxed dozen pencils, for example, costs the same as twelve individual pencils. Inflation here is higher than elsewhere – understandable when most of the goods are imported and the value of Sterling is weak compared with the Euro, and most of the goods are brought in from Eurozone countries. But prices are never revised downwards. When Value Added Tax was lowered to 15% here during 2009, none of the prices dropped. However I have no doubt they will increase once it is raised to 20% at the beginning of 2011. They’re never open when I can get there. This is one of the few shops in my town (indeed, perhaps the only shop) which, in 21st Century England, still closes for lunch. Every day this shop closes between 1pm and 2pm, even on a Saturday, which generally is the only day of the week I can get to it. I’ve lost count of the number of occasions I’ve been unable to buy something or have had to change my plans, in order to be around when the shop is open. On one occasion I waited until after 2pm on a Saturday, only then to discover the place was closed for the afternoon for staff training. I’m only glad I do not have to make a long journey specially to visit the shop because I would be angry if I found the shop was closed if I’d come from out-of-town. Fortunately I do not have to rely on this store for my stationery fix. It’s nice to go in and browse, when I can get in, and perhaps pick up a Tombow Brush Pen or a box of ink cartridges, but I probably buy more stationery from supermarkets than from this shop. I can get basic supplies such as pencils, index cards and notepads from my local Sainsbury’s or Tesco. For exotica I can go online to internet-based suppliers. Shops such as the one I have been describing I feel will have a hard time surviving in a retail environment experiencing a pincer movement from supermarkets on one flank, and niche internet sellers on the other. This shop seems to survive on its photocopying and printing business, which is just as well because if it had to live on its retail sales alone, I suspect it would have closed years ago. Pencils and Music no more? Regular visitors may have noticed Pencils and Music on the blogroll. 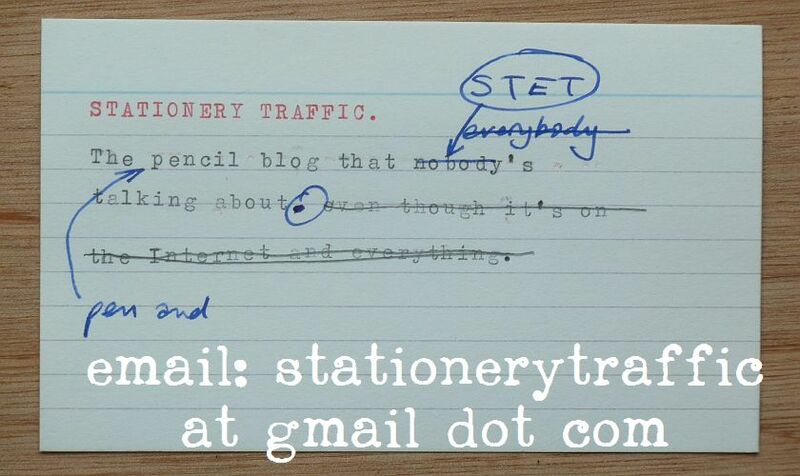 It was one of the first pencil blogs I found on the internet, and very entertaining, too. It has been taken down; not for long I hope. Quick review time, again: this one is for a pack of four Stabil Swano 4907 pencils. I bought this pack in a branch of Ryman's (a chain of stationers' here in England) for £1.69, which is about 43 pence per pencil. They come in bright - almost livid - fluorescent colours. The four colours used - yellow, green, pink and orange - match the four basic colours used by Stabilo for their famous Boss highlighter pens. Each pencil is armed with an eraser tip in the same colour as the paint on the pencil, attached by an aluminium ferrule. 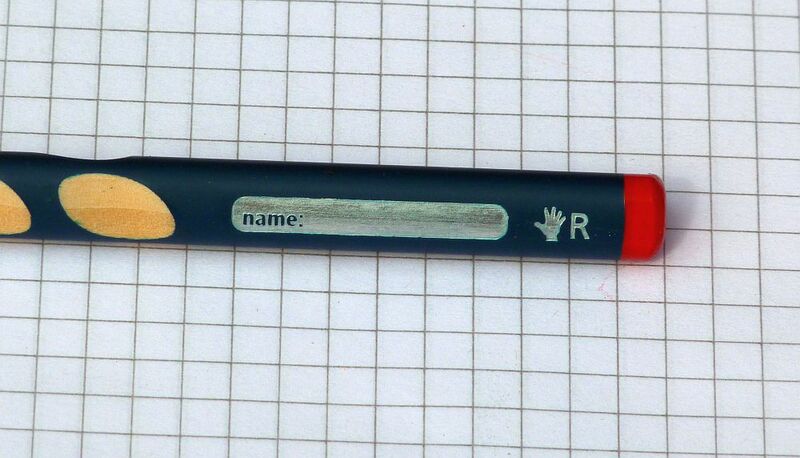 In the hand, the Swano handles like any other hexagonal pencil. The wood is good quality and sharpens well, and the eraser does its job adequately enough. The edges are slightly rounded, so it does not dig into fingers. The painting is nicely done and markings are understated; no foil blocking here, just the name, barcode and some serial numbering, but there is no country of origin information printed. I guess these pencils are made in Stabilo's factory in the Czech Republic, but if anyone knows better, please let me know in the comments. I used one of these pencils for a day or so to write notes at work. The lead is a dark and soft HB. On paper it does not feel scratchy, nor very smooth, but gritty; I can liken the feel of it to writing on sandpaper. It's not unpleasant, but it does not glide on the paper, if that is what you want. This utilitarian pencil is clearly designed for school in mind, and a four-pack should last a whole school year. In short, the Swano 4907 is a decent-quality pencil that is fun to use but which you would not lose sleep over if it was stolen from your desk in class. 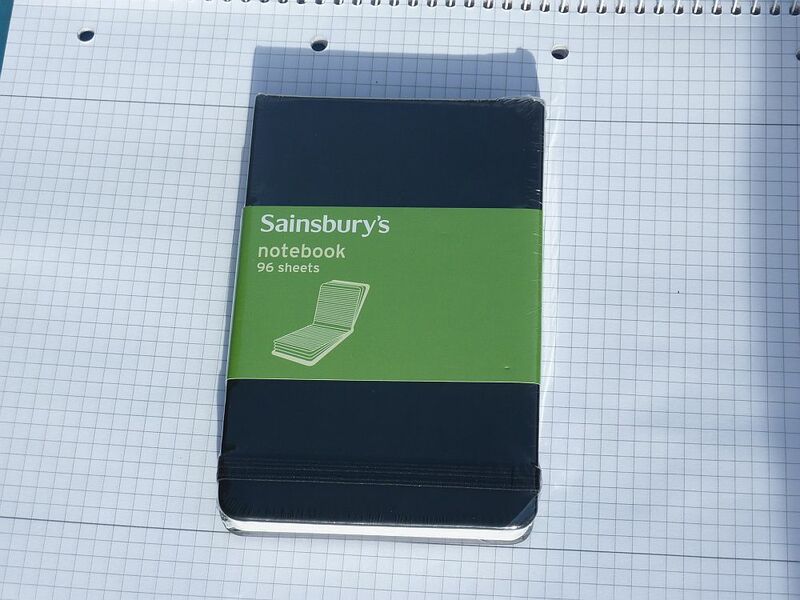 I have picked up several of these Moleskine knock-offs on sale now at Sainsbury's. They have 96 sheets (192 pages total) made from 70% recycled material which is finished in an off-white colour. All sheets are detachable, by the look of it. The paper is ruled and looks reasonable quality; a quick test with my Pilot M90 and Parker Blue Quink showed no sign of feathering or bleedthrough, and it takes pencil well enough, too. There's even a little pocket at the back for ticket stubs, receipts, postage stamps, and other kipple. This notebook is covered in black polyurethane, which has a satin finish that picks up fingerprints and grease marks. The best thing is that they are on sale at 75 pence each, making them less than one-tenth of the price of a Moleskine equivalent, which costs £8.99 and is certainly not ten times better than this. I suspect the low price is a close-out, so if you can get hold of one of these, give it a go. This blog is still in a "development" phase so I've changed the design again. I found the bookshelf background to be too busy and distracting, and I've changed it to the plainest possible. I've also changed the title picture. Let me know what you think! 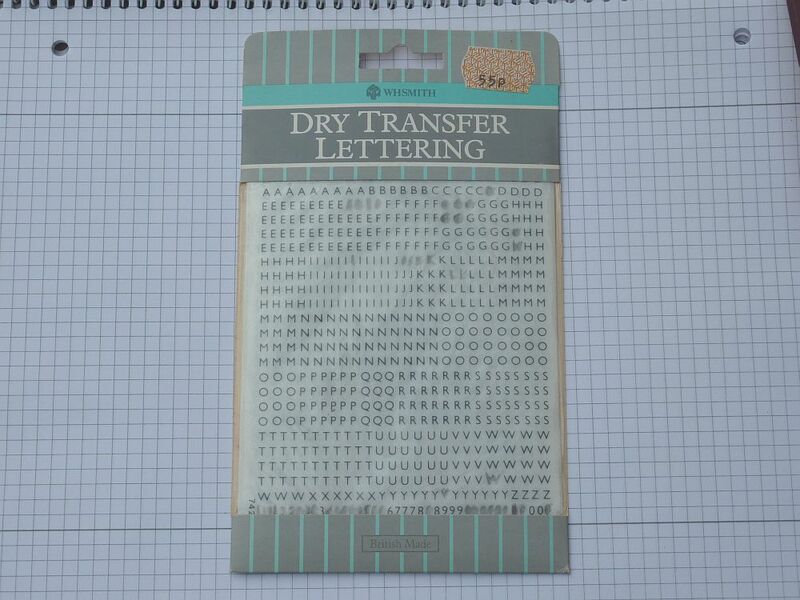 Second in this series, a set of WH Smith dry transfer lettering, c. mid-1980s.